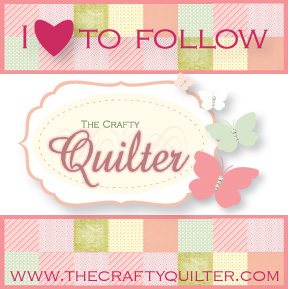 I have really enjoyed seeing all the projects from the Christmas in July blog hop and am in the mood to sew some more! I hope you like my Christmas Windows wallhanging tutorial. Update: Check out my recent posts for more projects and another tutorial! 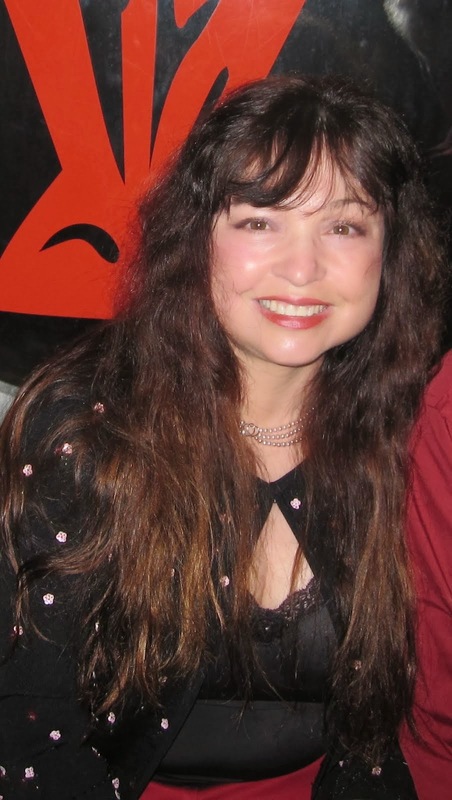 July 12: Amy – Amy Made That! Let's Get Started on the Tutorial! 1. 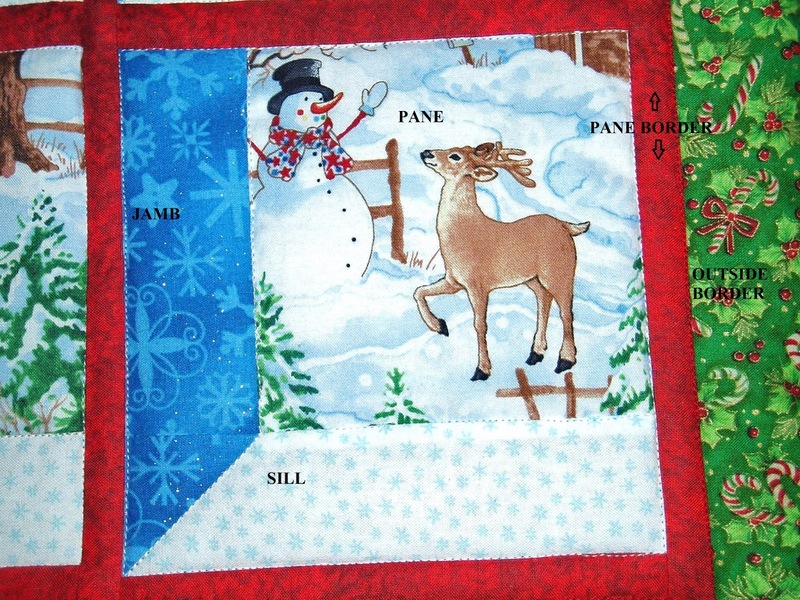 A Christmas panel or fabric with a christmas or winter scene. 7. Backing fabric: You need about 1/2 yard bigger than your panel. NOTE: I'm using the terminology sill, jamb, and pane, even though that may not be technically correct. I bought 1/2 yard of this "winter scene" fabric at Hancock's of Paducah online. It is called Snow Magic by Wilmington. I cut a 15 inch square and this will be my panel. Note: Before cutting, be aware that every cut will take away 1/2 inch off of the scene (1/4" either side of each cut which ends up in the seam). The way I cut mine, the main snow man's face ends up disappearing into a seam. You'll see it in some of the photos and later how I fixed it. IMPORTANT UPDATE: Before cutting, please read this note sent to me by an experienced quilter regarding cutting a panel that includes a human figure (and may apply to other situations as well). I was really glad to get this hint to avoid a lot of frustration with the panel I have shown you at the end of this post! Patricia says, "I have a hint about the attic window treatment on the fairy panel for you. If you split her and add the width of your sashing once or twice along her arms and legs she will become dis-proportioned. For example: a cut between the elbow and shoulder would make her upper arm much longer than the lower arm. Fussy cutting might work better. Lay strips of fabric (or Paper) the finished size of your sashing across the panel and look at what parts would be revealed and what would be hidden. If you look through a real window you don't see what is behind the sash. The strips can be moved around and then you can do some fussy cutting keeping the body proportioned. You could try it with a magazine picture to see the different effect. Scenic panels don't distort as much as a human figure.<-- That is good to know-- thanks Patricia! Step 4: For the "window sill and jamb" take the dark and a light fabric you've chosen and cut 2 inch strips the width of the fabric. Step 5: Sew the dark blue strip to the five inch square on the left side. Step 7: CUT THE "SILL" (light fabric). The size will be the width of the block you just sewed Note: (in my case 5 inches + 2 inches minus 1/2 = 6 1/2 inches.) I cut nine 6 1/2 x 2 inch strips. Step 9: Fold or draw a line diagonally on the 2 inch square. Lay this on the left side of the light color "sill" piece as shown above. Step 10: Sew along the fold or diagonal line you've drawn. Trim off leaving a 1/4 inch seam allowance. Press towards the dark fabric. Step 11: Sew this strip to the block which now starts to have the 3 dimensional appearance. Note: my blocks are now 6 1/2 inch square. Here's a photo of how the blocks look so far. With all the "sill" strips sewn on, the blocks are starting to look like window panes. This is when I noticed in the lower right hand corner, the snowman's face is gone! Step 12: Square up your blocks. (make sure they're as square or rectangular if applicable, as possible) Photo is of my blocks laying on the red fabric. Note: I went ahead and took that lower right hand block apart and cut a new 5 inch square which contains the snowman lower in the square so his face won't disappear into the seam. Much better! Step 13: Cut 1 inch strips (you'll probably need at least 2 or 3) from the fabric you want to use to border the window pane blocks. Photo of the red border fabric sewn onto the tops of each block. Step 15: Trim the red (I'll say red but you know I mean whatever color you're using) borders evenly and press the seam toward the border. Step 16: Sew the blocks together vertically taking care to make sure each block is lined up accurately. Note: In this photo you can see that I have not sewn the red border to the bottom left hand block. Step 17: Sew on side borders to left side of all 3 columns and onto the right side of the right hand column. Press seams toward the border. Even up, keeping all raw edges as straight as possible. Step 18: Sew the 3 columns together. Press seams toward the borders. This measures 21 1/2 inches now. Note: Here you can see that I still need to square up the bottom right which is sewn down a little longer the the left two columns. Step 19: Cut 2 inch strips the length of the fabric for outside borders. Step 20: Sew outside borders to two opposite sides. Step 21: Press open, seam to outside border. Square up and then sew outside borders to the other two sides. Step 22: Square up corners and even out anything that looks crooked. Step 23: Cut some batting 1-2 inches larger than the panel. Step 25: Finishing: Layer your backing, batting, and wall hanging top, baste, quilt and then bind. I used the stitch in the ditch method. This pictures shows the direction to sew. I also stitched in the ditch in the outside of the pane border. Baste around the outside of your wall hanging and then square up the corners and trim the excess backing and batting from your wall hanging. Fold square in 1/2 (into a triangle) and press. Lay the triangles onto the top, back corners of your wall hanging. To be sewn into the binding. Here I've sewn on the binding to the backing with the triangle hangers in each top corner. Inserting the dowel into that little triangle part. I hope you have enjoyed this tutorial. If you have any trouble or find mistakes, please contact me so I can answer questions and correct errors. Also, I'd love to see your Window wall hanging if you make one! I love this Michael Miller panel I got on ebay and wanted to do the tutorial with this panel. But since it was so big, I wanted to try the technique out on something else first. It measures 22 x 42. I will probably cut it into 5 1/2 inch x 7 inch "panes". If you do the math, that would be 4 rectangular panes across and 6 down. It will look so cute-- like you're peeking into the window on Christmas Eve and see the Christmas fairy by the Christmas tree! The next cute panel is 20 x 18 inches, not counting the red and green gum drop border which I'd probably cut of. So the "panes" would probably be 6 5/8 inches x 6 inches. (3 panes across and 3 down) Or it might be better to do 5 inches wide x 6 inches long (4 panes across and 3 down). To decide, I'd lay my clear 15" square ruler down to see what might get sewn into a seam and try and choose the best cutting strategy to prevent that from happening to important parts of the scene. Thank you Sheri of sharing your great tutorial. I have linked it in the website of the National Swedish Quilt Guild in order to share it with our members and other visitors in our website. Thanks so much for sharing this tutorial. It turned out great! And I have to say it's my favourite of this Christmas in July Blog Hop. This is a great tutorial! I've seen windows like this in quilts, but the directions always seemed way too complicated. You've made it easy. This is fantastic! I have a few Christmas panels laying around that I haven't known what to do with so this is perfect. Thank you for a great tutorial. Thanks so much Sheri, I have always wanted to try an attic window quilt but never had the confidences to try, you have just made it so easy with this tutorial. I love the print that you used, isn't it amazing how you can play with fabric and create something totally different. The best idea I have seen for using a panel! Thanks for sharing. Thank you for sharing your wonderful quilt with us. It is one of my favorites....sometimes i am at a loss on what to do with a panel but you have opened my eyes...thanks so much. Thank you for teaming up with Julie and giving us a wonderful tutorial. I have seen window panes and thought they were just too, too hard. You have broken this down into easy peasy steps that even I can do. The triangle corners for a small wall hanging is just another case of an easy can-do. Many thanks for sharing an "easy" can-do tutorial when someone else breaks in down into manageable steps for us. A friend gave me a panel of cats that is already into blocks that I can easily do this. Our quilt guild calls for small quilts for the small quilt auction for our quilt show every two years. So I can do this for next years quilt show. This is very timely. Also, I would like to ask if you have a pattern name for the sheep quilt in your banner. My brother raised purebred Hampshire sheep as 4-H projects and I would love to make a quilt for him. Actually, his wife is now a pastor for her job now that she's "retired." I think a sheep quilt would be a perfect gift for them. I made a quilt for her when she was ordained. I made a quilt a queen quilt for me from her scraps then - three years ago - I just have to scallop and bind it. Again, many thanks and I'm very happy that quilting is now your passion. Thank you so much for this tutorial. I am kind of new to quilting and this is an idea that I can take and run with!!! Now I need to go find some panels! I have always admired them but never knew what in the heck to do with them!! Thank you so much for the tutorial - very cute window panes and I loved the advice on how to cut them. I especially loved the corner hangers. Great tutorial. I have always wondered what to do with a panel, now I know. Thanks. Nice tutorial. You made it all look very easy to do. Thanks. Great job mom, will you make me a squid / pirate panel thingy? This is such a wonderful way to use a panel...thanks for showing how you did it! It's beautiful! This is a great project for me! Beautiful job. Great little quilt! Love the non-mitered corners for the windows! What great tips ty, I really want to try this. Wonderful inspirational tutorial! My next project, for sure. Thank you, and I think the best on this blog hop! Thank you for sharing this wonderful project! I just love the Chtristmas scene fabric and how you used it. Your tutorial is great. Greetings from Scotland, from Edith. Thanks for the great tutorial. I have never thought of doing an Attic Windows quilt this way. This is such a pretty project! Thanks for the good tutorial, too. I love diagrams with labels!! Me gustó tu tutorial. Muy buena solución a la costura en "L". What a great tutorial, you made it so easy to understand, thank you so much. Yours is one of the easiest to understand tutorials on Attic Windows I have come across! Thank you for sharing it with so many of us. I just got this email about your quilt tutorials and love them..I used a panel of musical instruments and cut them apart and made a quilt for my granddaughter....(she plays guitar)..it turned out pretty good although I'm just a pretty newbie at it.